Beauty for women has always played a major role. Especially a problem are the legs. Due to the environment heels stiffen, and the nails lose their shape. It is very important that our feet always looked nice, and the nails on them were neat and beautiful shape. But not all nature has given a beautiful shape nails. It is influenced by factors such as an uncomfortable, clenching shoes, high heels. After all, most women sometimes have to spend all day in heels, which by the end of the day the legs swell and hurt. In order to make the legs rest, to care for them, take a bath at least once a week and properly trim the nails. This is important not only for beauty but for health. Because improper cutting of the nail, it can grow into the skin, leading to discomfort and even suppuration. If your nails become dry or too soft, took dark or become yellow, you can use salt or lemon juice. Type in a suitable container of hot water and add 2 tablespoons of lemon juice or 100 grams of salt per liter of water. These trays will help your nails to acquire the normal color and healthy appearance, and therefore confidence. After raspalis feet, take a pumice stone, scrubbing brush or a special scraper and remove the Horny layer of the skin. Wipe with a dry towel and lubricate foot nourishing cream, and then fat. After these baths, your feet will be soft and smooth. Toenails should be cut straight, not at the root. Do not cut corners at the edges. It is best to file them with a nail file, starting from the edge towards the middle, otherwise the nail will crumble. Do not use a metal nail file, grab a nail file for nail polishing. If you have appeared ingrown nail, you will help bath of chamomile. First you need to brew chamomile tea: 2 quarts water 6 tablespoons dry chamomile, pour boiling water and leave for an hour. After that, strain the infusion and warm, but not boiling. In warm infusion lower legs for 20 minutes, then peel off the ingrown nail and put cotton soaked in iodine. The optimal length for a nail – when the nail does not reach the edge of the finger. Cuticle is better to use wooden sticks. You can use special scissors, but they are very sharp and they can easily get hurt. Trim and treat your nails before steaming, because steaming they will be soft and treatment can cause only harm (breaking or splitting of the nail). The form of nails usually are selected depending on the structure of the hand and nails. Also, take into account the profession of the woman and her preferences. To determine what form of nail you, you can just experiment or go to the beauty salon. If your professional activity is directly connected with children, with medicine or cooking, then preference is given to rounded shape of the nail plate. We must note that this form requires you to wear short nails, length free part should not be more than 2 millimeters. If your nails longer, then carefully look, they will not. In addition, experts believe that this form was more suited to the girls whose fingers thin and long. To give the nail shape of a Crescent with a custom nail file. If you have the fingers full, then you should give preference to the square shape of nails. This will opalite free edge of the nail in a straight line, and ends of the run so as to obtain a square. If you have wide nails, make them a little narrower. Give them the shape of a trapezoid which gradually tapers to the tip the nail plate. The corners of the nail you can make to your taste. It is possible to round out and you can leave them sharp. Girls with long fingers are most suited to oval nails. However, all women can safely choose this form. In order to give the nail plate such shape, saw her on each of the two lateral sides toward each other. Check if the resulting width. If not, then go ahead and continue to narrow on both sides of the nail. The sharpened shape of the nail plate suitable for girls with narrow, neat hand. For this nail will opalite to give a triangular shape. In the center of the nail plate must be an acute angle. The beauty of the manicure is directly proportional to the length of the nail. 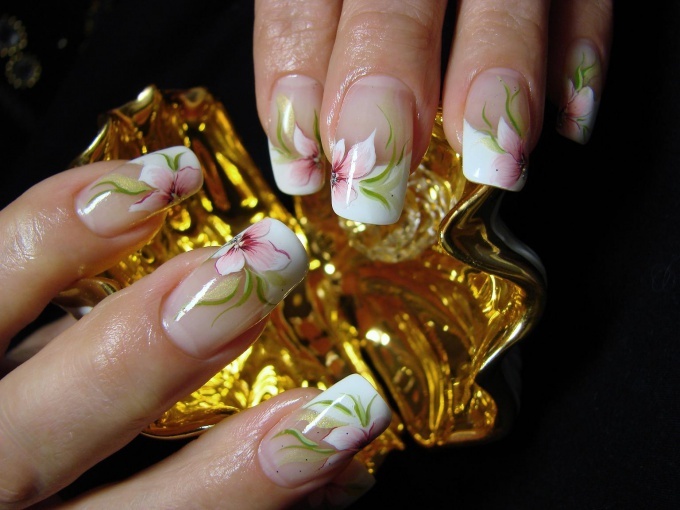 To do a manicure, as well as to fix the shape of the nails better have a master who has professional skills. In the salon you will do on the highest level. Not every woman is happy with the shape of your nail plates. Trying to fix the situation, many ladies prefer to change the shape of the nails by increasing, however, this is not the only way to make beautiful nails and give them a well-groomed appearance. If you have a wide nail bed, prefer oval, oval-square or almond-shaped form. In order to change the shape of the nail, making it more rounded, you should grow your nails to medium length and neatly cut, smoothly rounding out the corners. During coating of the nail plate decorative varnish, you should not fill all the space of the nail, it is necessary to leave the edges unpainted strip, this will allow you to visually lengthen the form. If you wish to change the shape of a square nail, it is not necessary to apply a transverse decorative drawings. Use the vertical line, elongating the shape of the nail plate. If you prefer a French manicure, it is best to choose a jacket with strongly folded edges ("smile), this will enable you to extend your nails and give them an elegant look. In the triangular shape of the nails free of the need to file so that it looked oval. The nail plate should be trimmed on width and slightly sause. When such coating of nail varnish better select the part that is located closer to the free edge, bright color. This technique will help to change a triangular shape, giving the nail plate a harmonious look. You can also apply on nails vertical decorative pattern. If your nails are too rounded, do not use the pattern "polka dot", and does not focus on the middle of the nail. To visually lengthen the shape of the nail plate, it is necessary to focus on the outer edge, in particular, you can decorate it with drawing. Little nails with a small surface, to grow to the maximum acceptable length. Wanting to change their shape, it is possible to resort to the procedure. Remember that the regrown part of the don't have the size to beat the nail plate, otherwise you get the opposite effect, and nails will look unnatural and harsh. If you have long fingers and the nail bed has a very elongated shape, you can change his appearance, preferring the classic jacket with straight edge. Don't make the nails too long, otherwise your hands will look disproportionate and not very aesthetically pleasing. If your nail plates are rectangular in shape, and you like a more rounded nails, the situation can be corrected zakrepiv tips when performing a manicure. Remove sharp edges and paint a dense, even layer. At a rectangular shape do not use Polish bright shades, better stop your choice on a neutral, slightly muted colors, but the pattern you can choose any.